It turns out from my telly that Mark Clemmit from The Football League Show was also covering this game. As a result, I’m not sure I should bother now because, y’know, my shtick is to squeeze myself into one-size-too-tight jumpers and be cloyingly matey with managers as well. This town ain’t big enough for the both of us and, in fairness, those jumpers ain’t big enough for either of us, either. It’s been an indulgent Christmas, *pats stomach*, so I can’t really talk about his girth. On the plus side, he wasn’t there doing one of his ‘potted history’ bits. Those should really inspire a new drinking game for Football League fans. *Second and third words of report being “were formed” = 2 fingers of ale. The Football League Show is a rare example of the BBC doing football less well than ITV. There’s no doubt Matt Smith is a much smoother operator than Manish Bhasin. Remember about three years ago there was that guy who went for a driving job interview at the Beeb, but after a series of misunderstandings ended up being interviewed on-screen on the BBC News channel. Well, even he looked more comfy in front of camera than Manish. I liked the simplicity of The Championship on a Sunday morning. I just want to see the goals and major incidents. I don’t need loads of whimsical featurettes. I don’t need to hear the views of dickhead fans. I have to type out the views of a dickhead fan nearly every week, and that’s annoying enough. Most crucially, I really don’t need to hear Steve Claridge whining on in his usual way, sounding like a balloon being dragged across some kitchen lino. Still, at least they’ve got plenty of stories to work with vis-à-vis League One, as the third tier has arguably never had a higher profile, what with four big recent Premier League names knocking around thinking they’re too good for it. 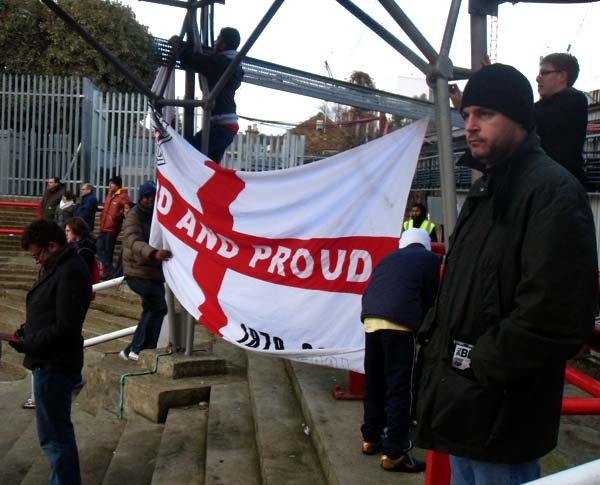 Fans of Leeds United, Norwich City, Southampton and Charlton Athletic are probably used to trip to Hartlepool and Exeter by now, but won’t want to be hanging around for too long. All four sides are in good order, but only a maximum of three can escape this year. For Charlton, this season has allowed them, in part, to reacquaint themselves with London neighbours they’ve probably given scarcely a thought to for some time. Early this season, I watched them at Leyton Orient as their fans asked “who are ya?” not seemingly by way of scorn but as a genuine enquiry. It took them 15 seconds to proffer a similar question here against Brentford, only to be told that they weren’t “famous anymore”. Charlton won that game at Leyton 2-1 after facing a deficit at half-time. The difference that night for them was the youngest player by some distance, Jonjo Shelvey (currently still two months off his 18th birthday), who scored a cracking 25-yard equaliser and buzzed between the boxes like a fly between two lightbulbs. I first watched Shelvey play just over a year ago, for the Charlton Academy, and his progress to being a vital cog in the Charlton midfield has been rapid. That morning against Chelsea’s lads he stood out more for the fact that with his clean shaven pate, he looked like an albino salamander, than for being, at that time, a fringe first-teamer. Now he stands out for his mature, yet passionate, performances and the £8m price tag that Phil Parkinson has slapped across his shiny swede. I was partly motivated to come to this fixture simply to watch him again but, sadly, with Christmas fixtures coming rapidly, he was rested to the bench, only coming on in the 54th minute. By which time, like against Leyton, Charlton were playing catch-up against neighbours they may have previously thought well beneath them. 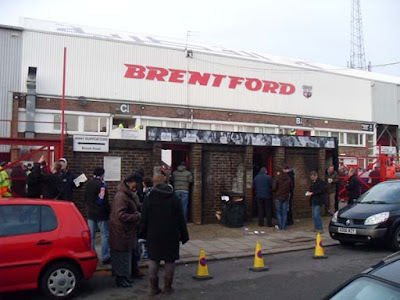 For this game, during a first half of decent if not overly enlivening football from both sides, Charlton were firmly in the ascendancy, Akpo Sodje being a constant thorn in Brentford’s left-hand side. However it was actually the home side that took the lead three minutes after the interval. 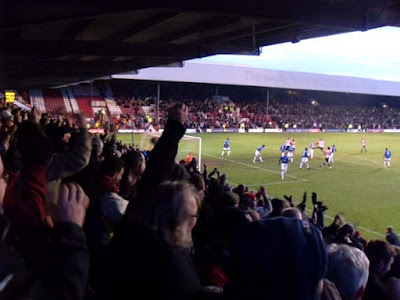 Brentford gaffer Andy Scott had sent on Carl Cort to replace Arsenal loanee Rhys Murphy at half-time, and the former Premiership striker made an instant impression, turning his man inside the box and slotting past Charlton keeper Rob Eliot. Despite scoring, Cort is not currently expecting his short five-month contract, signed so that his long-term knee injury could be assessed, to be renewed when it expires next week. So it may have been a bittersweet goal for Cort and now, in hindsight, for Brentford’s supporters, as within ten minutes, Charlton were level. Nicky Bailey had threaded a pass through the Brentford defence before Chris Dickson was brought down by keeper Lewis Price who was perhaps fortunate to escape with just a yellow card waved in the direction of his nervous mush. In the absence of suspended regular penalty taker Deon Burton, Bailey stepped up to crash home a crisp drive of a spot-kick to equalise. After this the game moved end-to-end, with Brentford finishing the stronger. Andy Scott’s aims for Brentford are, according to his programme notes, to sustain League One football, whereas Phil Parkinson has the expectation of automatic promotion on his shoulders. 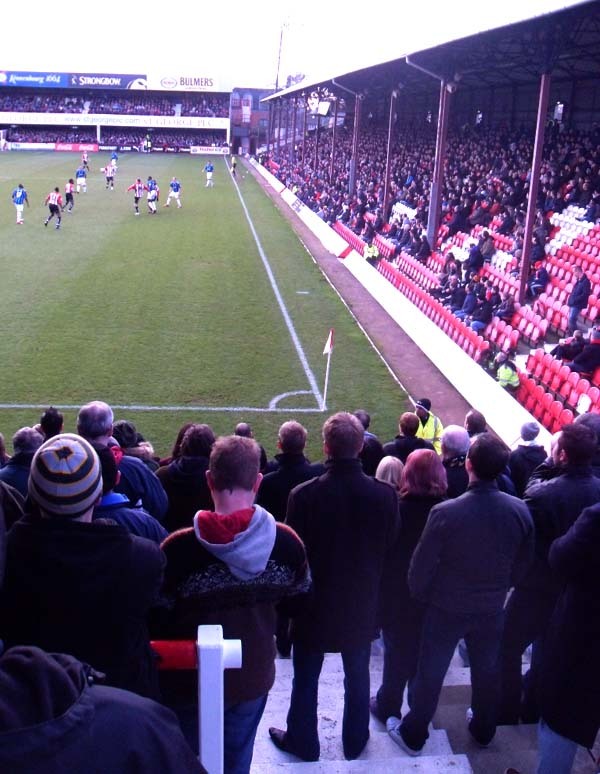 As such, Brentford would have been delighted with their point, but for Charlton it meant looking over their shoulders at their yellow and green clad stalkers lying, as I write, in third. Another fantastic read from the best blog around. Keep it up Skif old chap! You're very kind to say so. Especially coming from an award-winning blogger such as yourself. Congrats on that again by the way. Hard to disagree on the subject of the Football League show although the lack of adverts do give it the edge for me. I like Clem on the radio but his encounter with the BBC wardrobe department has been catastrophic. I can't imagine he wore that clobber before he was famous - it reeks of Trinny and Susannah. Matt Smith is authoritative indeed and would, sadly, be an improvement on Manish, nice guy as the latter genuinely seems to be. Claridge's tendency to talk about every game as if he had seen all ninety minutes of all of them is grating as well as his dismissal of anyone who hasn't "played the game". That description of Claridge's voice is marvellous. On the one hand, I'm very grateful to the BBC for 'The Football League Show' - regular, reliable coverage of my team. But on the other, I agree that in most respects - Manish, Claridge, Clem's pally featurettes, the dreaded texts from idiots - it's poor. And what's that bizarre studio all about? Still, I can't help but think that ITV would do it worse. Matt Smith might be a more natural presenter than Manish, but he's also more unctuous and smug. Plus with ITV there'd always be the possibility of Robbie Earle or, worse still, Andy Townsend turning up as special guest pundits. Well, thankfully 'The Championship' on ITV didn't do punditry (I think it's this concept, rather than the people doing it, that I am more frustrated by), and not muich in the way of hosting really, quick straight to camera links, although I think Townsend and Earle did host in Smith's absence on one or two occasions. So, nobody's perfect, I agree.